Hiya! My name is Kasey Golden and I love to create illustrations that make others smile, laugh, and (I can't believe it) even feel inspired! Drawing is how I spend most of my free time, and now I even make YouTube videos to accompany a lot of my illustrations! I have really enjoyed creating videos showing my process and challenging myself through my "500 Drawing Prompts" series to just keep drawing! I love sharing my art process on YouTube with all of my supporters, but can't keep it up when a paid job is competing with my free time. Even the smallest amount of help goes a long way in keeping me creating, entertaining, and inspiring others! 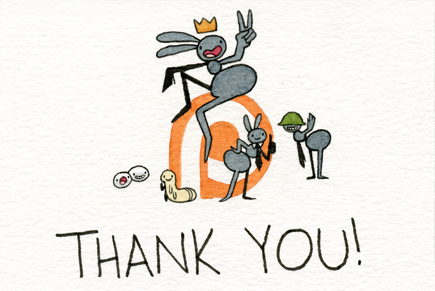 By supporting me not only do I get to keep regularly posting videos, but you get to see my sketches that are forbidden from the internet, download coloring pages of my illustrations including those amazing 100-ant pieces, or be a part of exclusive Patreon-only discord chats and art live streams! Personally... I'm just interested in those li'l ant buddies! Thank you so much for helping me continue what I love! Thanks, really! It doesn't take much to EGG me on and stay productive! Access to my sketches I never let the internet see, eek! Helping me create videos regularly! Thank you, thank you! Five dollars might not sound like a lot, but much like a colony of ants, when every dollar comes together, it can do wonders! You WORK really hard to support those you believe in, and I appreciate that! Thanks a lot! Patreon-only discord chat where I can give art critiques and generally chat more! With this goal I can set aside more time for live streams with Patrons-only!